How do I get a BuzzCard? Before you can be issued a BuzzCard, you must have a Georgia Tech Identification Number (gtID #). Your gtID# is a universal number that identifies you throughout the various campus departments, while the BuzzCard is your physical identification card. A BuzzCard cannot be issued without a gtID#. Student gtID#’s: Upon admission to the Institute, the registrar assigns you a gtID#. Faculty/Staff/Affiliate gtID#’s: An authorized department administrator or campus sponsor must submit a gtID# request on your behalf. 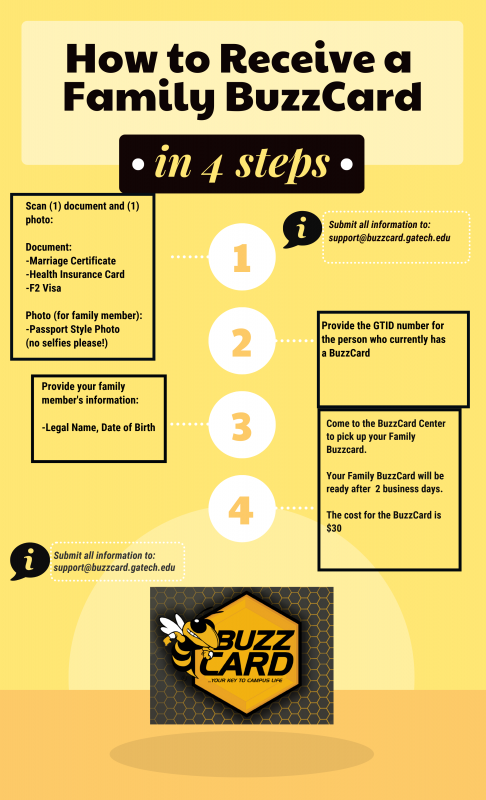 Immediate family members of students, faculty, and staff (spouses, domestic partners, and children over eighteen years of age) can obtain a BuzzCard through the BuzzCard Center. The cost for the Family BuzzCard is $30.00. Family members must present their government-issued ID (driver's license, passport, permanent resident card) to BuzzCard Center staff, in order to receive their Family BuzzCard. Family member gtID#s are generated by the BuzzCard Center. All Family BuzzCards will be processed after 2 business days. How do I receive a BuzzCard in person? Visit the BuzzCard Center! We are open Monday - Friday from 8 AM - 5 PM*. *We observe special hours during holidays and Institute school breaks (we'll post changes to our hours on our website). We are located on the 2nd Floor of Barnes and Noble @ Georgia Tech. How do I receive a BuzzCard as an online student? ​​ Welcome to Tech! You are embarking upon a difficult but rewarding journey. Online student cards will be shipped within 10 business days of your request. In-person BuzzCards for online students are $30.00. Shipped BuzzCards for online students are $33.00. There is a $3.00 shipping fee. Please provide a passport style photo for your BuzzCard Picture (no selfies, photo should be taken on a white or off-white background, save photo in JPEG or PNG). How do I get my BuzzCard? First-Year students will receive their BuzzCard during Freshman Orientation (FASET). Students must be enrolled and assigned a gtID# by the Registrar before a BuzzCard can be issued. Faculty/Staff will receive their BuzzCard from the BuzzCard Center, after their PSF is approved.